BEGINNING APRIL 1, 2019 ALL WEEKEND ROUNDS MUST BE BOOKED ONLINE. 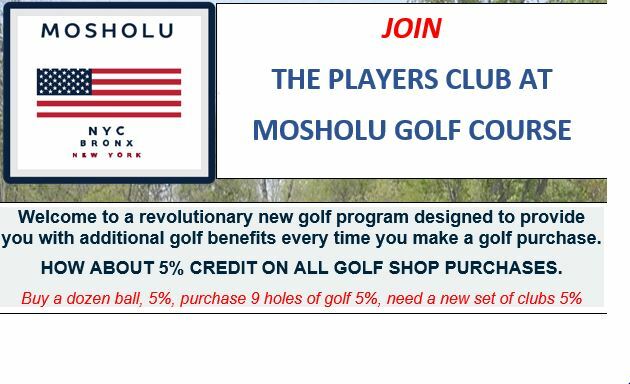 click for detail, signup in proshop TODAY!!! a partnership with the Met Section PGA and MGA Foundation. Mosholu Golf Course, founded over a century ago as one of the first public golf courses in the United States, has enjoyed a renaissance in recent years with the complete reconstruction of its 9 hole layout in 2007. Among the best conditioned municipal courses in the area, its rolling fairways and contoured greens provide the perfect golf experience for both beginners and experts alike, with a friendly atmosphere where you can bring the entire family. Our 20,000 square foot putting green, chipping area and driving range also provide a place to warm up before you tee off, or to hone your skills for your next time out on the links. In addition, it is the most convenient golf course to get to for residents of Manhattan, Bronx and lower Westchester – located just steps from the Woodlawn stop of the 4 Train and just a few hundred yards from Exit 13 off the Major Deegan Expressway. Come join us to experience a round at Mosholu today.